This Beautiful Handmade Lampwork Glass Vessel, was Lovingly Created by me! By using a Torch to melt different colored glass rods, and carefully forming them around a metal mandrel to create a Tiny Unique Glass Vessel! 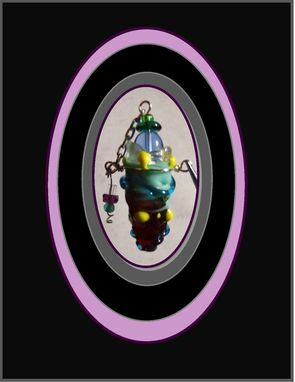 It is adorned with a silver wire wrapped holder that enabls you to hang it on a chain. The Custom Gem bead Topper is connected with a safety chain to the vessel base. I also added a Beautiful Accent bead dangle Charm, to make it even more Special! 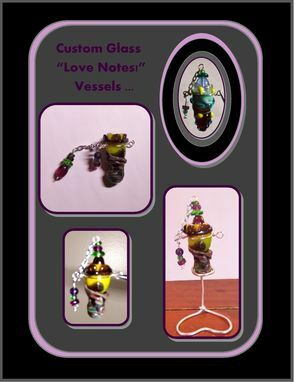 My "One of a kind" Artistic Vessels can be filled with your favorite Perfumes, Essential oils, or a Special Love Potion! You can even put a tiny scroll inside with a love note,Wish, a Prayer, words of Love, a Poem, a Memory. Or add Soil from a Special Hike as a Memorey, Sand from a favorite beach! Matching Vessels can be worn or hung in a Special place, and filled with a Scroll containing Words of love, Promises, or Sentiments from a Husband and Wife,Lovers, Boyfriend Girlfriend,Mother Daughter, Sisters, Best friends,Grandmother Grand Daughter. Vessels have even been used for cremains keepsakes, of a Loved One or Cherished Pet. This Vessel measures a Full 2" and 1/4 inches tall from the top of the gem stopper to the bottom of the Vessel. It can be worn on a chain or cord for a necklace or hung in a Special place. These vessels are custom made and "One of a kind"each vessel will be similar to the pictures but may differ in design, colors, & gems.